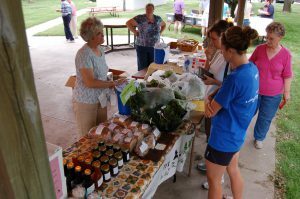 As the first Farmer’s Market approaches on Tuesday, June 5th, from 5-7 p.m. in the downtown park, vendors continue to sign up to sell various homegrown and homemade produces. Next week you can anticipate seeing some of the following venders at the Farmers Market. Aunt Mary’s Famous Kolaches, Cathy Wismer selling fresh bread, jams, jellies, produce, herbs quick bread and soup mixes, Marcee Van den Berg selling fruit pies and produce, Tanya Davis selling Mary Kay Cosmetics, “Homemade Patch Works” by Elvina Janzen including table runners, candle mats, place mats, coasters and wall hangings, Luke Schaldecker’s Garden Produce, and Mary Ellen’s pastries, New Year’s Cookies and baked goods. With the 125th Anniversary of Henderson taking place this year, the Q125 Committee will also have a booth to hand out information about community day, sell memorabilia, sell tickets to the alumni banquet, sell tickets to the Henderson Community night at the Saltdogs, and answer general questions about Community Days and the Q125. This year there are several different organization serving meals each Tuesday. The Henderson Chamber of Commerce will kick off the meals with a Hamburger Fry on June 5th. You can pick up a Farmers Market Brochure with a list of meal providers for the year at local businesses or during the Farmers Market so you will always know what to expect. If you are interested in selling homemade and homegrown products during a Farmers Market this summer contact the Henderson Chamber of Commerce, at 723-4228 or hchamber@mainstaycomm.net, at least one week before the Farmers Market you plan to be a vendor at. Help us kick of the 2012 Farmers Market season in the Downtown Park on Tuesday, June 7, from 5 to 7 p.m.